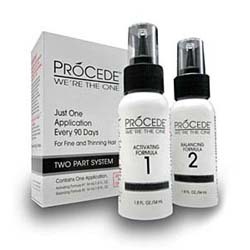 ProCede hair care system. ProCede is a new, wholly unique patent-pending formula you apply directly to your scalp that works on your own real hair, making it thicker and fuller with just one use every 90 days. This product was merely an idea 9 years ago and now finally, this breakthrough discovery may help millions of men revitalize the appearance of their fine and thinning hair without a daily regimen. With your help we can reach more people and let them know about Procede whether this product works or not. I was skeptical when I saw this product on tv, like many others. But it really works. Took longer than I expected though, I started to see signs of improvement after about 3-4 months. I see fresh regrowth and hair is stronger and softer. So far it is working nicely.